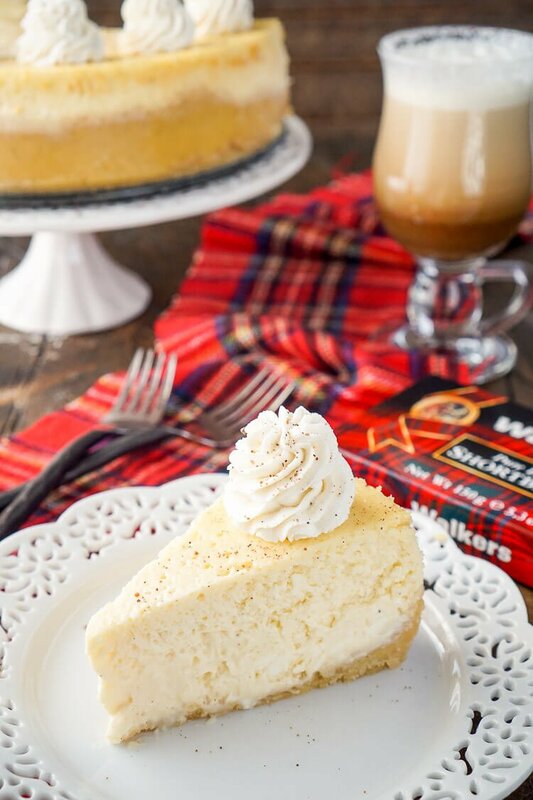 This Eggnog Cheesecake Recipe is enclosed in a sweet shortbread cookie crust and laced with whisky and nutmeg for the ultimate holiday dessert! 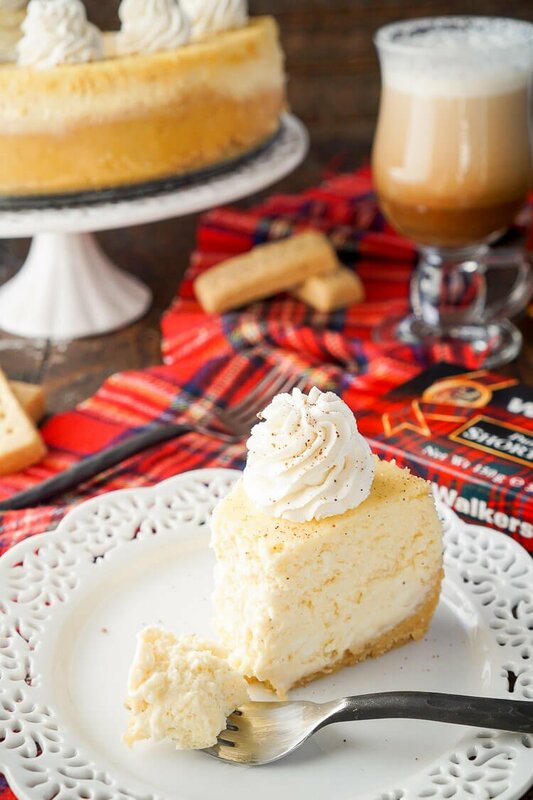 This Whisky Eggnog Cheesecake Recipe is not to be missed this holiday season! Lately, I’ve been thinking a lot about Scotland and our trip there this past spring. When I think about it, my heart aches, but in the best possible way. It aches to go back, to take in Scotland’s natural beauty and it’s lively and hospitable culture once again. It aches for days off the grid with Matt in the Isle of Skye, living off Walkers Shortbread surrounded by the blues of the fairy pools and the waves at Talisker Bay. Okay, I’m back, sorry about that, I just had to go talk myself out of purchasing a ticket on the next flight to the UK. So instead, I’m going to bring a little taste of Scotland into the holidays right here at home to console myself! And how are we going to do that, you ask? With shortbread, whisky, and eggnog. Oh and Tartan plaid, because if there’s one thing us Mainers have in common with the Scots, it’s our love of flannel! Eggnog was never something that appealed to me. It wasn’t until college that I grew a liking for it, but now it’s the flavor that defines Christmas for me. I can’t help but smile as the holiday spirit awakens inside me when it hits my taste buds for the first time each year. While I love to drink it, (hot, not cold), I love working it into breakfast and desserts as well! 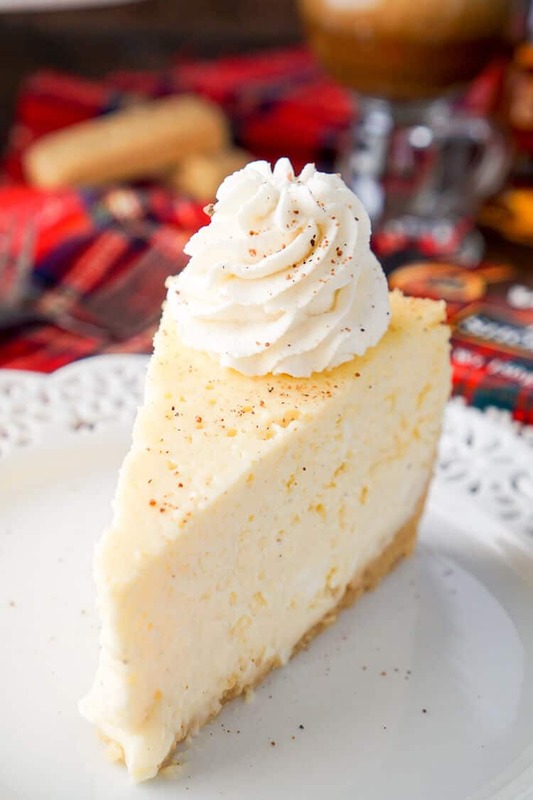 I’ve been wanting to develop an eggnog cheesecake recipe for years, but for a long time, making cheesecake was daunting. But now I’ve made three in the last couple of months, and you know what, they’re not all that scary! 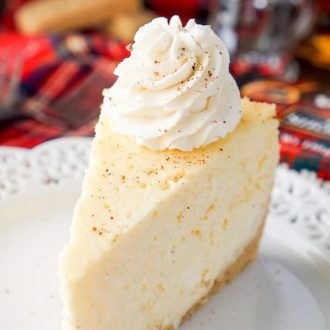 Yes, cheesecakes take a lot of time, but most of that time is inactive. There’s a lot of baking, cooling, and chilling, but, for the most part, you can be pretty hands off, which I love! And you’re rewarded with such an amazing dessert in the end that I’d say the wait time is totally worth it! I’m such an addict when it comes to shortbread cookies, there’s just something about that pure butter taste that just can’t be beaten! That’s why I love using them as the crust on my cheesecakes and tarts, I don’t always, but when I do, it really makes a statement. 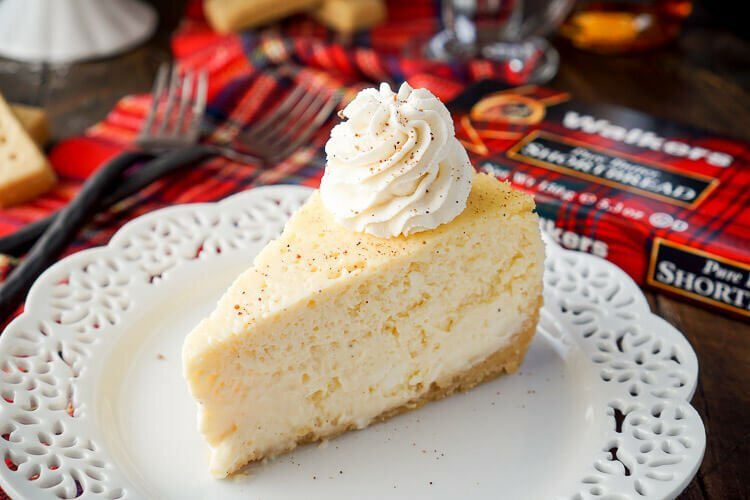 When the sweet butter taste of the crust combines with the creamy eggnog and smoky whiskey of the cheesecake recipe your mouth is going to do a serious happy dance. And then there’s the nutmeg, the essential spice that ties it all together. Add Walkers Shortbread to a food processor and pulse until fine crumbs form. You can also crush them by placing them in a large Ziploc bag and crushing them with a rolling pin. Transfer crushed shortbread to a medium bowl and stir in sugar and melted butter, stirring until evenly coated and the mixture sticks together when pressed. Transfer crust mix to a 9-inch springform pan and press the crumbs evenly into the bottom of the pan and about 1 to 1 1/2 inches up the sides. Beat cream cheese in a large bowl or stand mixer on medium speed until smooth, scrape down the sides. Add eggs one at a time, beating between each addition, scraping down the sides as needed. Gradually add in the eggnog and whisky. Sift the confectioners' sugar, flour, and nutmeg together in a medium bowl, then fold it into the cream cheese mixture. Pour filling mixture into the prepared crust. Place springform pan in a larger baking dish and fill halfway up the pan with water. Shut off the oven and bake for 60 additional minutes with the door closed. Remove from the oven and transfer cheesecake to a cooling rack to cool completely. Once cooled, transfer to the fridge to chill for 8 hours or overnight for best results. Just before serving, whip the heavy cream, light brown sugar, and whisky until stiff peaks form. Pipe onto cheesecake and dust with ground nutmeg. The majority of the prep time is inactive cooling and chilling time. If you are worried your springform pan may leak, follow this process to protect it. Helloooooooo gorgeous! Holy toledos that looks AMAZING! Thank you so much, Yvonne! Can I substitute something for the whiskey? Like a rum extract perhaps? Hi Kellie, because such a small amount is called for in the recipe, it can be eliminated completely without impacting the cheesecake. It will remove some of the flavor, but you don’t want to replace it one for one with extract since extracts are highly concentrated. If you want to try and maintain some of the flavor, I would add 1 to 2 tsp of rum extract in place of the 2 tbsp of whiskey. I hope this helps! 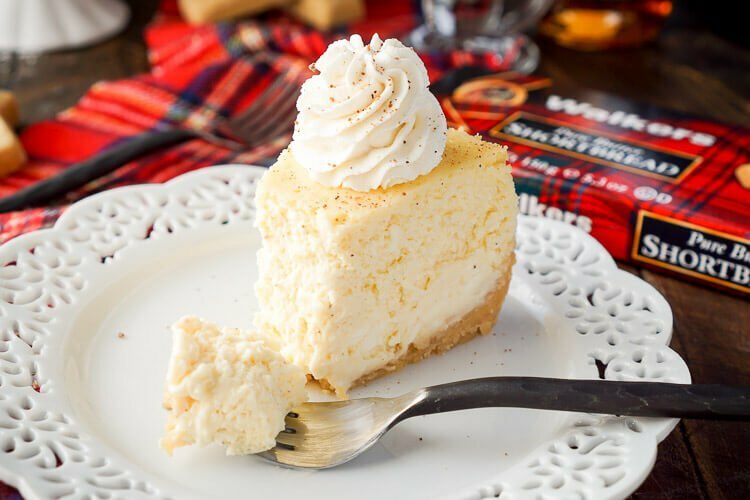 I want to make this scrumptious looking eggnog cheesecake; however, I am really cautious that placing a springform pan in a water bath will have leakage. Help!! Can I use jack Daniels??!? Definitely! Rum or Bourbon would be fantastic too! I used Jamison Irish whiskey. It was great. So glad you enjoyed it, Tony! I love Jameson, so I might just have to give that a try the next time I make it! Hi Alyssa, I’ve never tried it with sour cream, but personally thing whipped cream would be best. 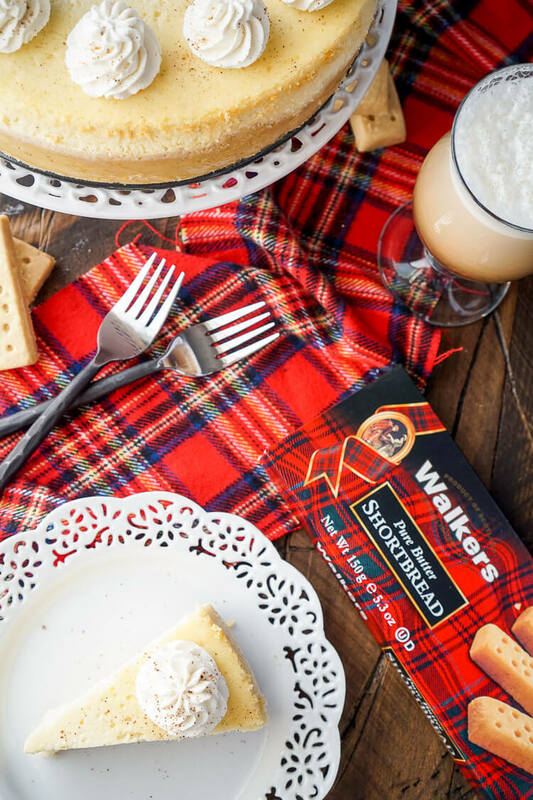 Love Love Love the shortbread crust and the scotch – no wonder you are making this over and over again! 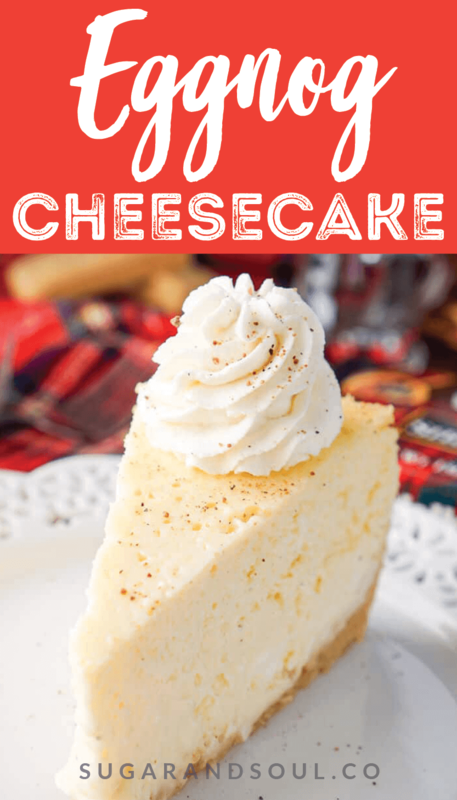 What a delicious spin on a cheesecake! I especially loved the shortbread crust.